Wait a minute…..this has nothing to do with knitting! And you would be correct. It has everything to do with baking, though. Remember when I warned you that I would post about some of my baking adventures? Here we go. About a month ago, I made the mistake of mentioning homemade croissants to my partner. While he got excited about this idea, I had no idea what I was about to get myself into. I started googling recipes and in mentioning this plan to my plan to my mom, she mentioned that I would likely find a recipe in Baking With Julia, by Dorie Greenspan. Lo and behold, there was a recipe on page fifty-two of the book! I poured over that recipe for the next couple of weeks, formulating a plan of attack. Yes, I call it an attack; the process was going to take three days to complete. This past Friday, I embarked on what became an interesting adventure. I measured out all my ingredients into my kitchen aid bowl, only to find out that I couldn’t find my dough hook anywhere. I searched through every cupboard and drawer to no avail. I ended up leaving my mom a very distraught voicemail asking how to proceed without. 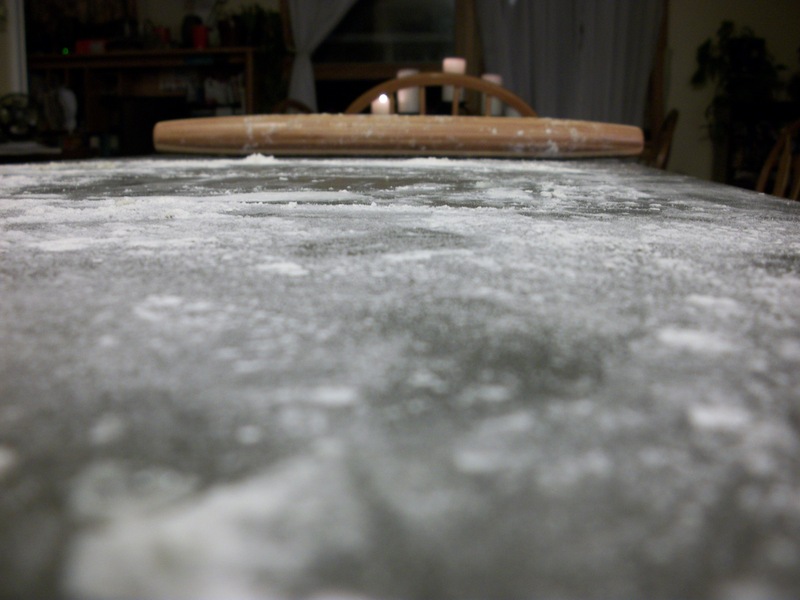 I plodded ahead only to find out that I had incorrectly measured too much flour leaving it too dry. I had to throw the entire batch out. This is when I realized that I didn’t have enough whole milk or yeast to start a new batch. I called my ex husband, as he was due to pick up the kids for the weekend. I caught him just in time to have him stop into the grocery store, walk him through a yeast purchase and then appreciatively thanked him for my replacement ingredients. Day One: Mom returns my phone call and instructs me to start with the paddle and then move to doing the rest by hand–I had a feeling that was going to happen. I precisely measure out my ingredients and proceed with the utmost trepidation. So far, so good. 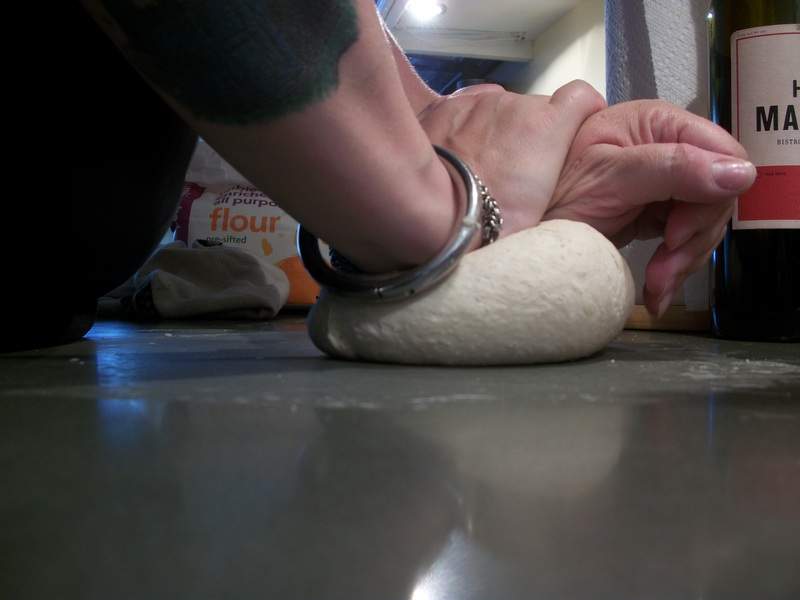 Kneading the dough is a lesson in how easy kitchen machinery makes my life. 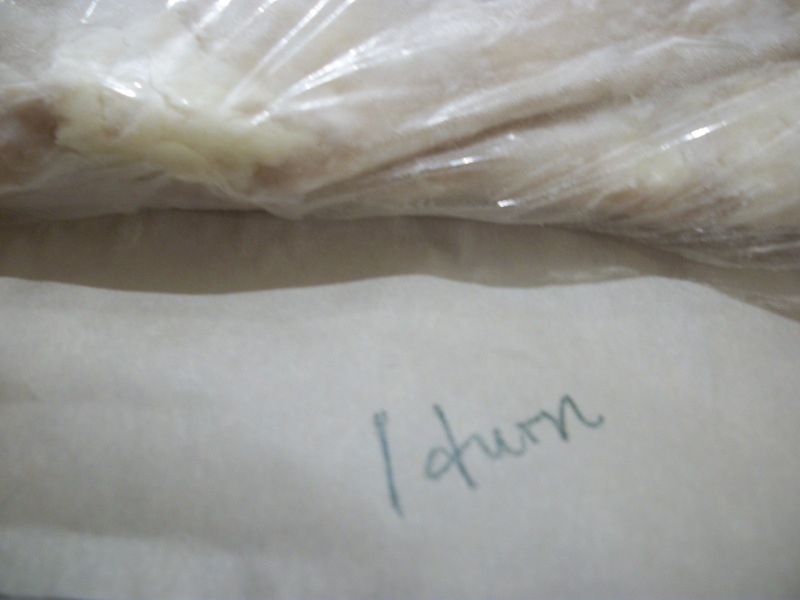 After allowing the gluten to a chance to relax, it gets wrapped, loosely, and placed in the fridge overnight. I head to the city to have dinner with friends and spend the night. Day Two: The next afternoon, I get back home and start the tedious rolling and “turning” process. 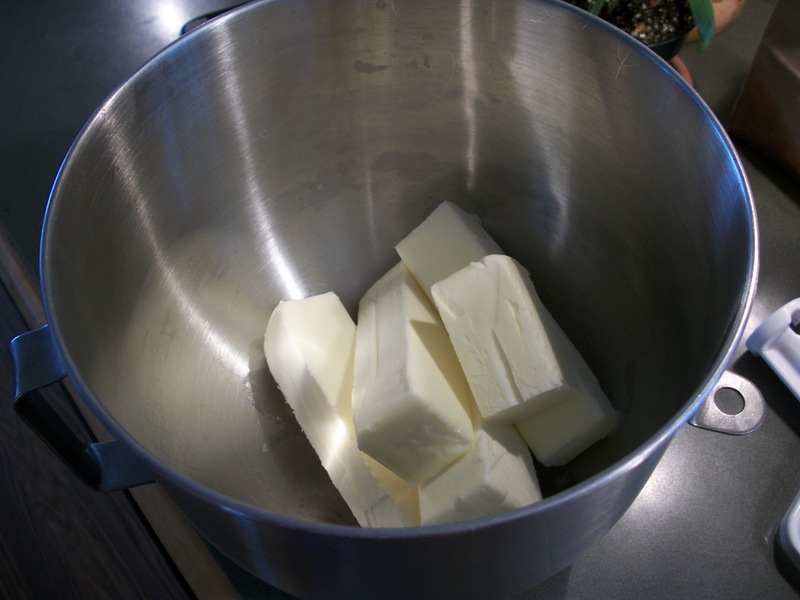 A bit of flour and four and a half sticks of butter go into the mixing bowl and are beaten until they scream (a running joke that my parents have always used when describing a recipe step). As this is mixing, I start searching for my tape measure. 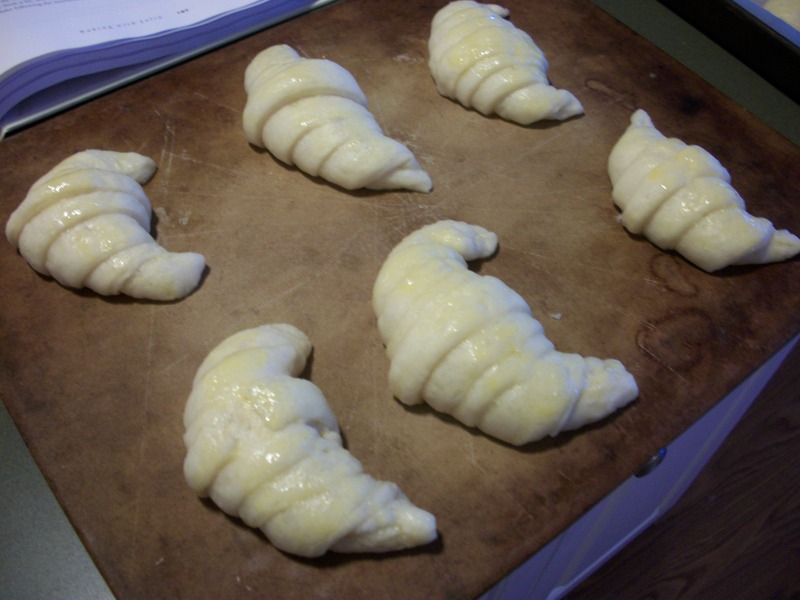 “Measurements are important when making croissants” is what I’ve been told–No kidding! The butter gets turned out onto some plastic wrap, beaten again and then formed into an oval before it gets put into the freezer to chill a bit. I’d been needing a new rolling pin and figured with my birthday coming up in a few weeks, this was the perfect excuse. 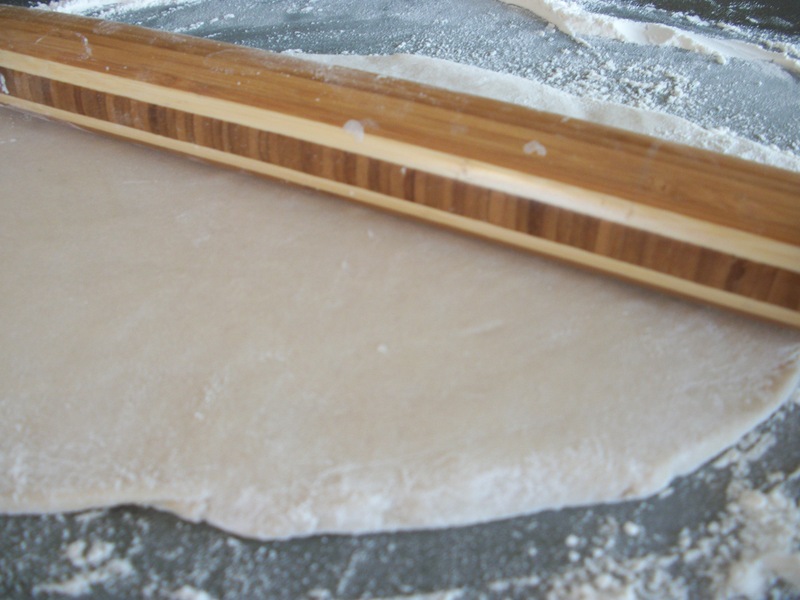 I found a beautiful inlaid, bamboo, tapered rolling pin that insisted it come home with me. How could I resist? 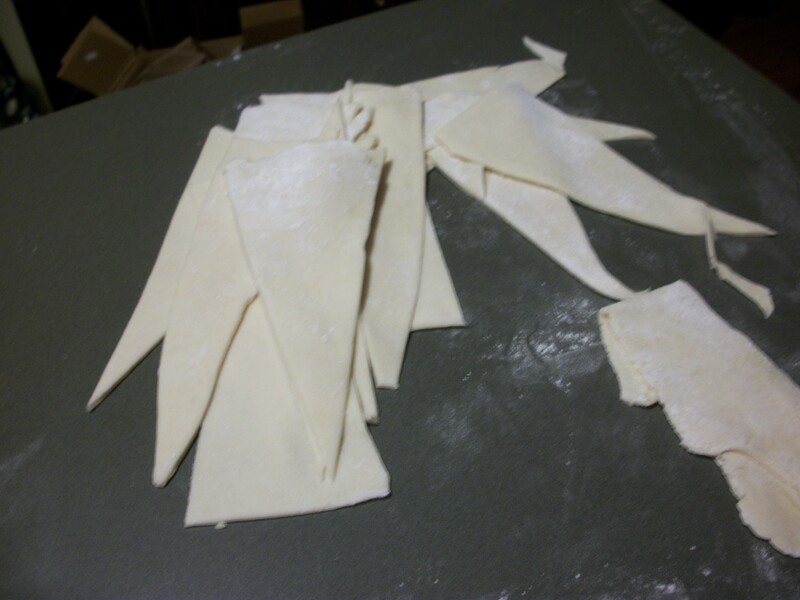 After incorporating the butter and wrapping the dough, we sat down to watch The Gamers: Dorkness Rising on youtube. This was a campy comedy about an RPG campaign and I finally got to understand a bit more how a campaign is played through. 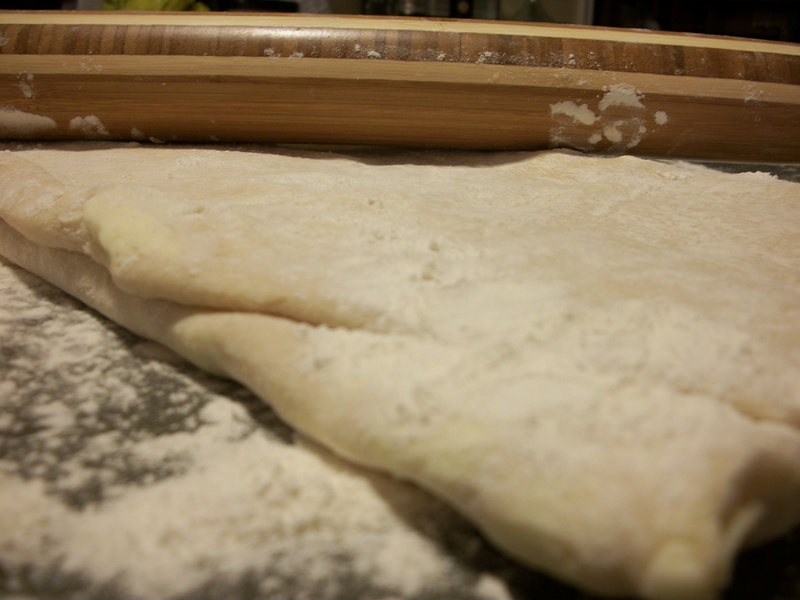 The new rolling pin made it easier to roll out the dough to a measurement of fourteen by twenty six inches. After cleaning up the mess all over the floor, counter and myself, we decide that dinner’s not such a bad idea. It’s not like we’re going to munch on croissants yet……..
Boneless sirloin tip steak, garlic mashed potatoes, sauteed snow peas and some red wine. After cleaning up and pouring more wine (Come on, I’m going traditional Julia Child-style here…. ), it’s off to the second turn! After the third turn, I clean up the kitchen and collapse on the couch to more mindless tv. After being awakened, we head to bed. I don’t want to, but I set my alarm for four am. Those croissants aren’t going to make themselves, lazy good-for-nothings…..
I’m not too happy when the alarm goes off in the morning. I groan, try to turn over and fall back to sleep but instead hear this sleepy, pleading from beside me: “Please……? Please will you make me croissants? Pleeeeeease…..?” How the hell can I say no to that? 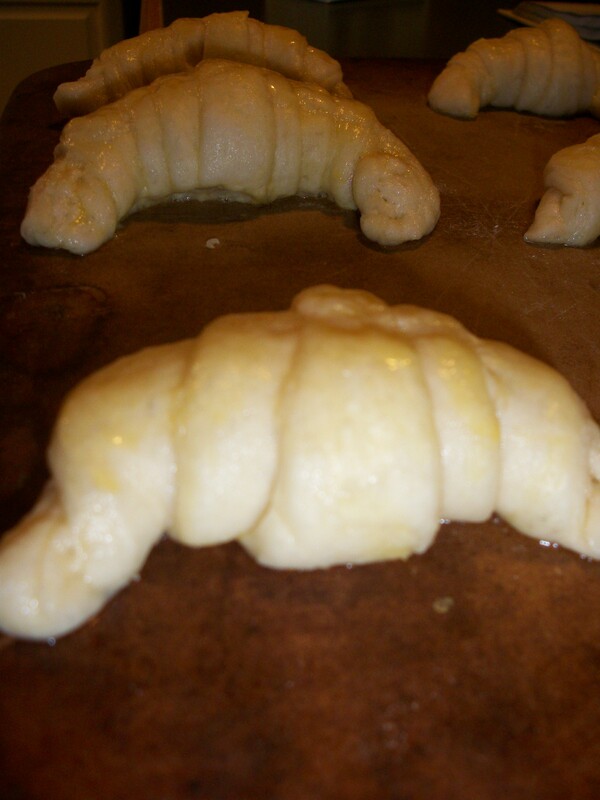 After rolling them out, one last, freaking time, I form them into the traditional croissant shape. They’re now egg washed and put into the oven to rise. The one redeeming moment of stumbling into bed after being up in the cold kitchen: having a warm body to snuggle my cold body against. I didn’t feel one bit guilty. Upon getting out of bed, I find that the croissants aren’t risen as much as they should be. As much as I love brisk, cool mornings, I start freaking the eff out. 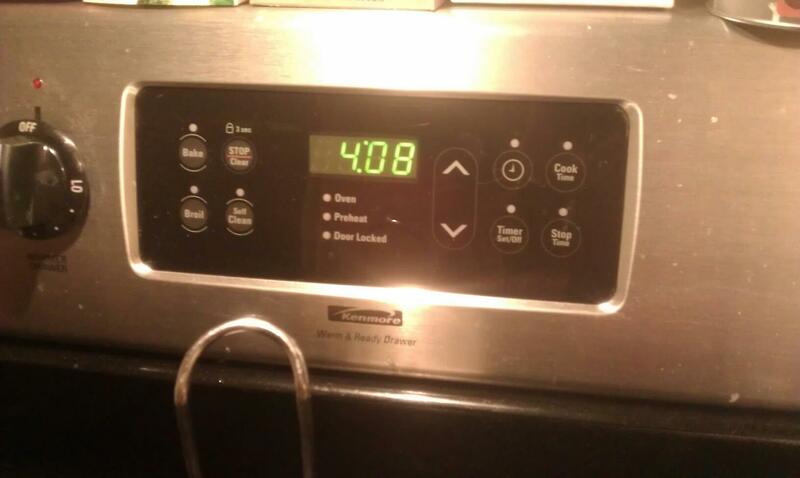 I fiddle with the oven, turning it on and off, to get them to rise properly. Coffee brews, I prep hashbrown potatoes and get some bacon going. Finally the croissants are ready to bake. Twelve minutes are all they take, but we have to be patient and wait to try them until breakfast is completely finished (that, and you have to let them settle a bit before biting into them–the cookbook says so). I’m sure that I sighed and got lost in the moment I took that first bite. 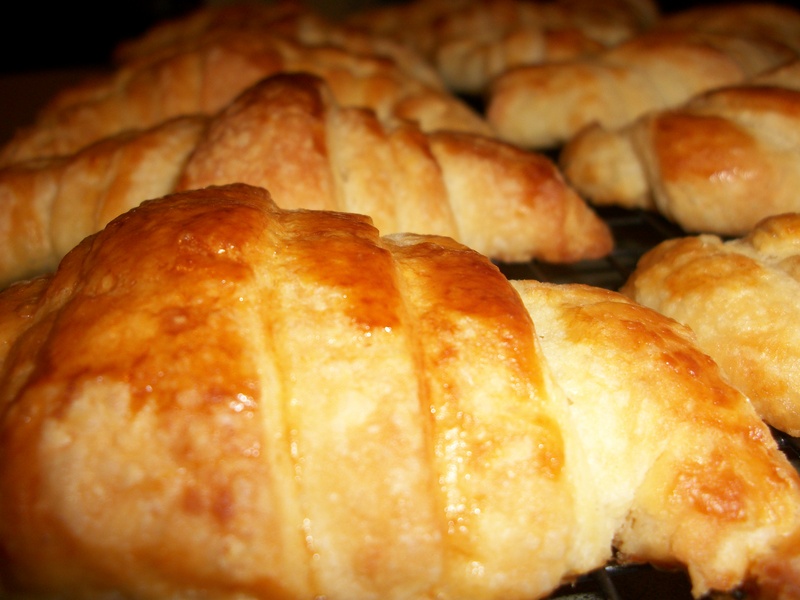 These croissants were everything that all my hard work went into. The cookbook tells you they’re best eaten the day they are made. I wrapped the leftovers and refrigerated them until the next day. When I popped them onto a pie plate and warmed them in a 350 degree oven for about five minutes, they tasted just as good as the morning I made them. I’m ready for a croissant now. Awesome-ness! They’re absolutely bee-you-tee-ful! You better make us some when we come to visit the next time! 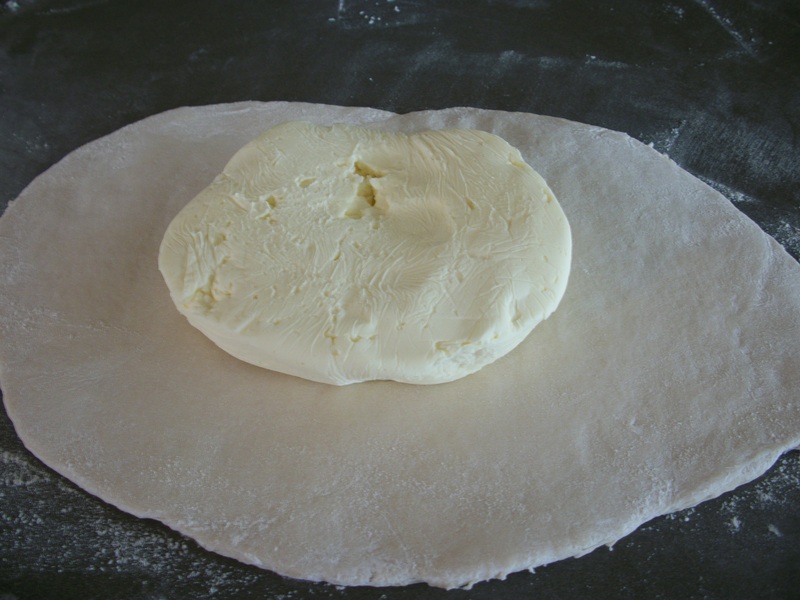 I have plenty of dough left over that I’m going to put in the freezer. I’ll be sure to make some for you the next time you’re up.